There was a bit of a complex debate last week over 1Password. I think the best article may be Glenn Fleishman’s “AgileBits Isn’t Forcing 1Password Data to Live in the Cloud,” but also worth reading are Ken White’s “Who moved my cheese, 1Password?,” and “Why We Love 1Password Memberships,” by 1Password maker AgileBits. I’ve recommended 1Password in the past, and I’m not sure if I agree with Agilebits that “1Password memberships are… the best way to use 1Password.” This post isn’t intended to attack anyone, but to try to sort out what’s at play. To net it out: local storage is more secure. 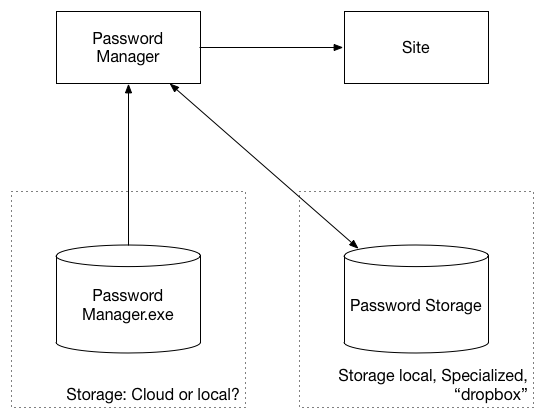 If your computer is compromised, your passwords are compromised with any architecture. If your computer is not compromised, and your passwords are nowhere else, then you’re safe. Not so if your passwords are somewhere else and that somewhere else is compromised. Netted out, getting code from a website each time you run is a substantial drop in security. So this is where it gets tricky. There are usability advantages to having passwords everywhere. (Typing a 20 character random password from your phone into something else is painful.) In their blog post, Agilebits lists more usability and reliability wins, and those are not to be scoffed at. There are also important business advantages to subscription revenue, and not losing your passwords to a password manager going out of business is important. Each 1Password user needs to make a decision about what the right tradeoff is for them. This is made complicated by family and team features. Can little Bobby move your retirement account tables to the cloud for you? Can a manager control where you store a team vault? This decision is complicated by walls of text descriptions. I wish is that Agilebits would do a better job of crisply and cleanly laying out the choice that their customers can make, and the advantages and disadvantages of each. (I suggest a feature chart like this one as a good form, and the data should also be in each app as you set things up.) That’s not to say that Agilebits can’t continue to choose and recommend a default. After years of working in these forms, I think it’s helpful as a way to break out these issues. I’m curious: does it help you? If not, where could it be better? Calling something in the cloud a DMZ is just weird. Realistically, everything is a DMZ. After all, you are sharing data center space, and if your provider is using virtualization, hardware with all of their other customers. As such, each and every network segment you have is (or should be) isolated and have only a very small set of allowed ports/protocols/ips etc. So in a very real sense, in public cloud every network segment is a DMZ. And when everything is a DMZ, then calling anything a DMZ becomes pointless. It’s better to call the segments by their function, e.g. web, app server, db, cache, mq whatever it is that the services in that security group are doing. It had the advantage of being easier to understand, closer to self-documenting and doesn’t imply a level of non-existent security like a term like DMZ does. Also by calling segments by their purpose, it points the security practitioner towards the right mindset of what types of traffic should or shouldn’t be allowed. All in all a very Jericho project kind of mentality. From an operations and security perspective, continuous deployment is either the best idea since sliced bread or the worst idea since organic spray pancakes in a can. It’s all of matter of execution. Continuos deployment is the logical extension of the Agile development methodology. Adam recently linked to an study that showed that a 25% increase in features lead to a 200% increase in code complexity, so by making change sets smaller we dramatically decrease the complexity in each release. This translates to a much lower chance of failure. Smaller change sets also mean that rolling back in the case of a failure state is also much easier. Finally, smaller change sets make identifying what broke unit and integration tests easier and far easier to code review which increases the chances of catching serious issues prior to deployment. All of this points to building systems that are more stable, more reliable, have less downtime and are easier to secure. This assumes, of course, that you are doing continuos deployment well. In order for continuous deployment (and DevOps in general) to be successful there needs to be consistent process and automation. There are lots of other factors as well, such as qualified developers, proper monitoring, the right deployment tools but those are for another discussion. Consistent processes are essential if you are to guarantee that the deployment happens the same way every time. To put it bluntly, when it comes to operations and security, variation is evil. Look to Gene Kim’s research (Visual Ops, Visual Ops Security) or more traditional manufacturing methodologies like Six-Sigma for a deep dive into why variation is so very very bad. The short version though is that in manufacturing, variation means products you can’t sell. In IT, variation means downtime, performance issues, and security issues. At the most basic level, if you are making changes and you are making changes to how you make the changes, you create a much harder situation from which to troubleshoot. This translates to longer incident response times and longer times to recovery which nobody wants. Especially in an online business. The easiest way to keep deployment process consistent is to remove the human element as much as possible. In other words, automate as much it as possible. This has the added advantage of saving the humans for reviewing errors and identifying potential issues faster. It doesn’t matter which automation mechanism you use as long as it’s stable and supports your operating environment well. Ideally, it will either be the same system as currently being used the by the operations and applications teams (e.g. chef, puppet, cfengine) or be one that can integrated with those systems (e.g. hudson/jenkins). With good check-in/build release messages, you even get automated logging for your change management systems and updates to your configuration management database (CMDB).